I had a sling when Landree was a baby, but we didn't use it much. It seemed hot and I never felt like she was comfortable and neither was I. A friend recommend a Moby sling to me to try with Hudson. I ordered mine at Target.com we've used it 3 times now and I love it! I plan to wear him on the plane trip home over the holidays. It's definitely not my normal 'style', but it's comfy and we both love it. Excuse the mirror and flash-I immediately cleaned it after taking this picture-seriously. That is too cool! I've been looking for something to use for Colty... at what point do they grow out of it? 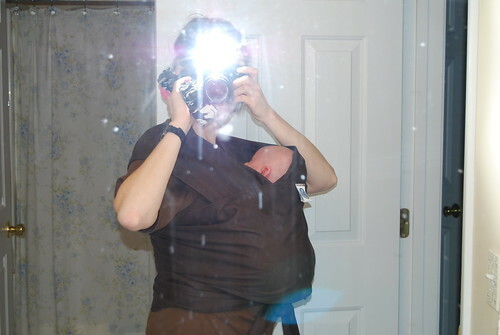 I wore Kate a lot in a similar sling type thing. I tried a couple of slings with Parker, too, but like you- I didn't think she felt comfortable and neither did I. But I think I'm going to try this Moby sling. I just think having her on me would free up my hands some and make life a little easier?